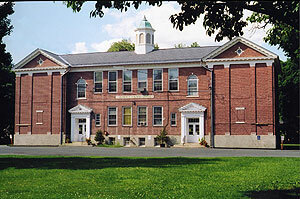 The Deerfield Teachers’ Center, 10 Memorial Street in Deerfield, MA. The Pocumtuck Valley Memorial Association (PVMA) was named for the ancestral peoples who first lived in this area. The PVMA opened its Memorial Hall museum in 1880 to gather and preserve the region’s history and to memorialize the lives of their ancestors, particularly those involved in the 1704 Raid. Memorial Hall is one of the oldest museums in New England and has an extraordinary collection of historic maps, art photographs, furnishings, textiles, and Native American artifacts dating from pre-Contact (12,000 BCE) to present, many of which are considered national treasures. A remarkable feature of its collections is the depth of documentation of its art and artifacts and their interrelation with journals, maps, manuscripts, and other archival sources in its Library which link surviving material culture to specific individuals and locations. Such links provide immediate, visceral connections to the people who owned and used them as they lived on the edge of Empire. For example, the Chauk deed establishing the English claim to this territory, but retaining communal Native use can be examined alongside the early proprietor’s map which subdivided the land among private owners. A tin-glazed earthenware plate given to a young woman by her father on her marriage is tangible evidence of settlers’ connections to European economy and culture. 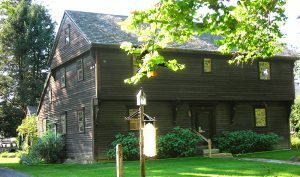 Indian House reproduction in old Deerfield, Massachusetts (original building dates to 1699) Photo by PVMA staff. The PVMA’s Children’s Museum, housed in a reproduction of a dwelling that survived the 1704 Raid, is a resource for modeling hands-on-activities. PVMA’s history websites are a valuable resource for teachers and students. American Centuries, www.americancenturies.mass.edu, the award-winning education website includes several thousand artifacts and historic documents in a digital archive designed for use in the K-12 classroom. Raid on Deerfield: The Many Stories of 1704, 1704.deerfield.history.museum, has received widespread acclaim for its approach to conveying multiple perspectives of a contested historical event. The Deerfield Teachers’ Center has experienced staff and offers American history resources (over 2,000 books, CDs, DVDs, periodicals, lessons, and kits).